This attractive hillside house sits in a large plot high above Wharfedale with magnificent views to the north over the town and valley. 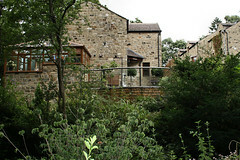 The view to the west is over a steep and wooded ravine which is part of the garden. The garden was large but had no structure to it and the dense planting was cluttered, slack and random. 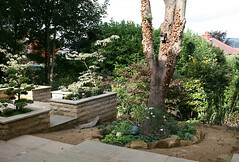 Originally most of the garden was not accessible from the house and there was also nowhere to sit and nowhere to go. 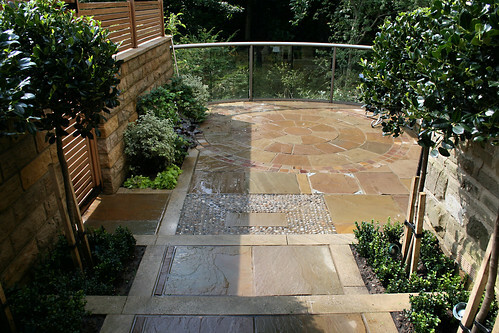 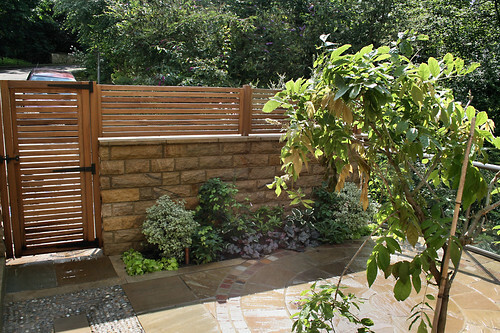 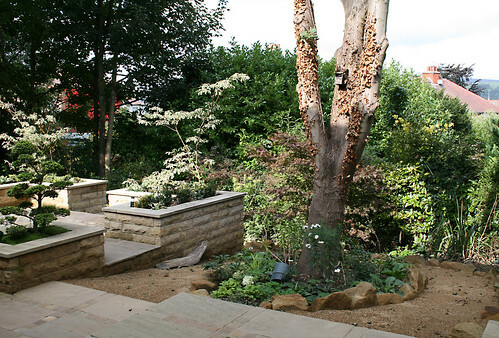 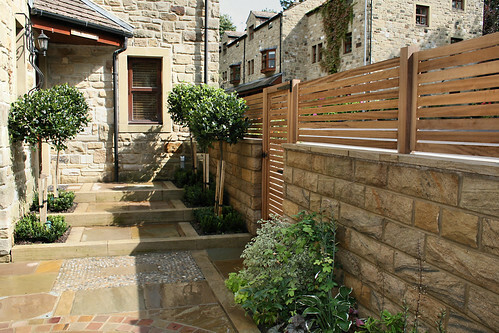 The brief was to create a stylish, simple and easily maintained garden with areas to sit that could be accessed from the house and that would make the most of the views. It was also important to create a path to the far side of the garden that in turn leads to a pathway into the town. The natural response was to intensify the special qualities of the site by creating a large terrace by the front of the house with a curved glass balcony allowing uninterrupted views over the ravine. The entrance to the house was designed to be formal and evergreen with the 3/4 Standard, free berrying J.C.van Tol Hollies flanking wide elegant steps. 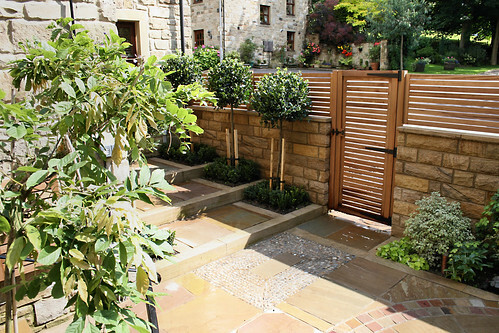 The stone was carefully chosen to unite the garden to the house with the chunky sawn sandstone steps mirroring the window lintels and providing a solid rustic entrance to this robust country house. 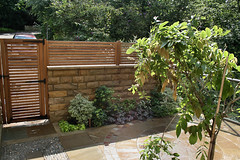 Likewise the hardwood trellising and gate complement the window frames, the venetian blinds and the conservatory woodwork. 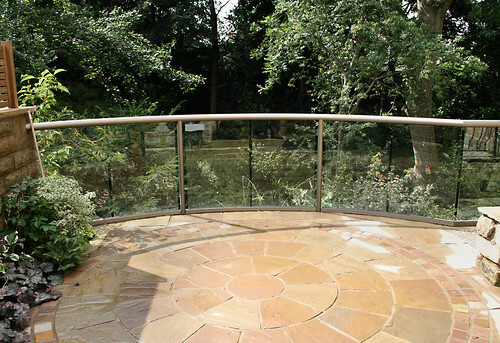 The curved glass balcony is stunning and shines brightly at the end of the terrace. 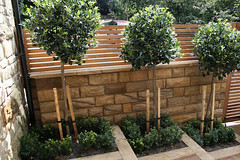 Trees have been planted into the view to provide spring and autumn interest, Cornus kousa 'Claudia' will colour in the autumn and have fabulous large brilliant white bracts in the spring when viewed from the elevated position of the terrace. 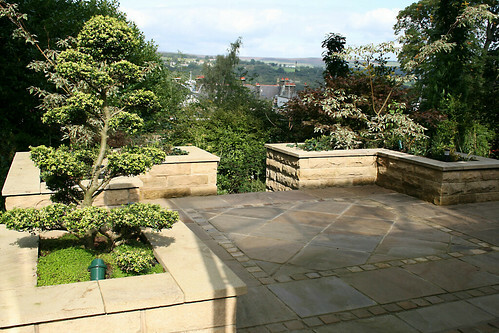 From here the garden descends to the woodland terrace at the back of the house which has been carved out of the hillside. 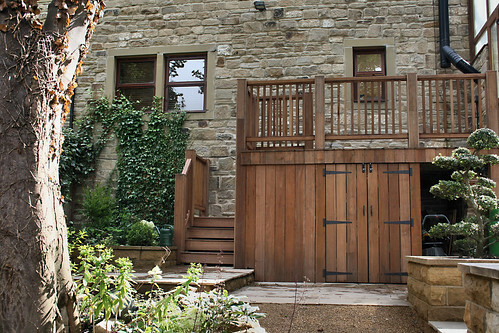 This can also be accessed from a new door cut into the back of the oonservatory which leads onto a beautiful hardwood balcony where there is room to sit and enjoy spectacular views over Wharfedale. 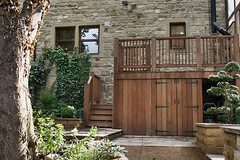 A a built in shed and log store under the balcony makes the best use of the space. 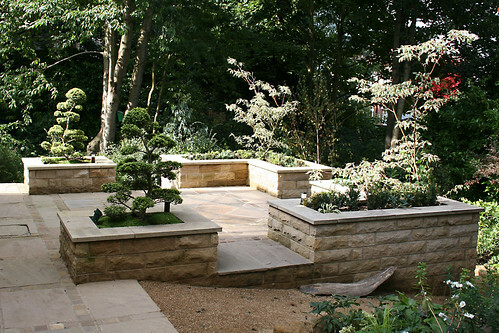 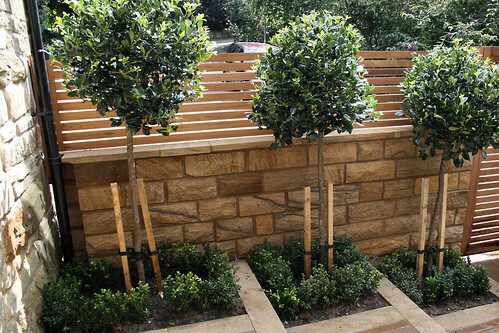 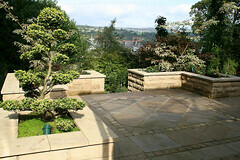 The Woodland Terrace has raised beds that house sculpted evergreen planting and double as seating plinths. 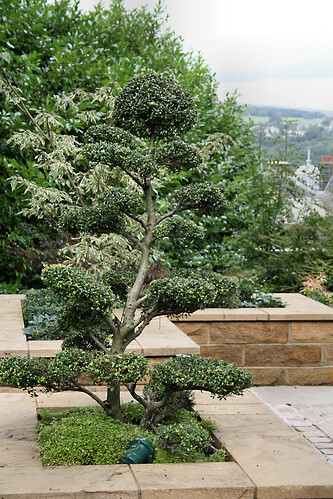 Two cloud pruned Ilex frame the front of the terrace whilst two dramatically shaped Cornus contraversa 'Variegata' theatrically point the way to the view over the valley. 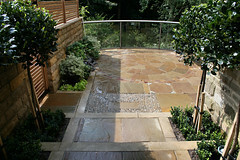 The solid against the see-through. 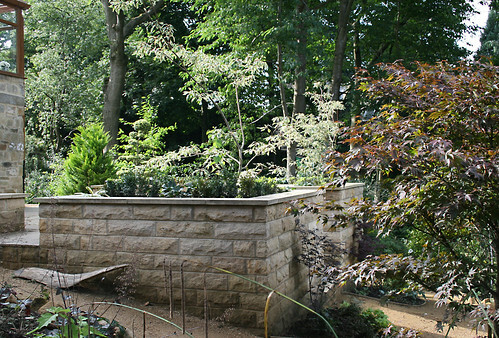 Beneath the Cornus is sculped Box to catch the falling coloured leaves. 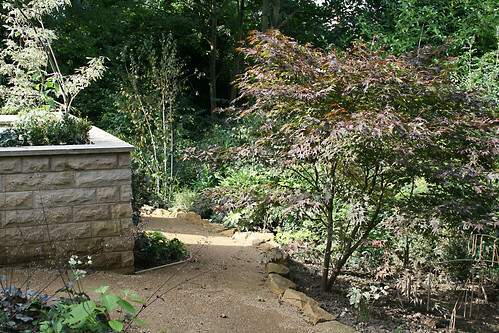 There is the start of a woodland walk with cool shady plantings. 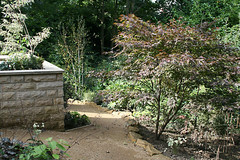 Two more Acers were planted to complement an existing large Acer developing a colourful tree walk. 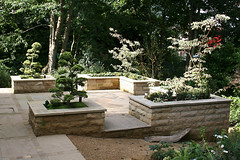 The planting becomes more fluid and organic as pathways allow a journey through areas of subtly changing atmospheres of light and shade to reach the gateway on the far side.